When considering joining our network, there are a few key questions you may have. One of these questions could be about the market positioning of Antal International. How will a new office fit into the existing network of 100+ offices? We simply, work together to find synergy with the skills which a new owner brings to Antal and our existing offices. Offices channel their attention into niche areas and this enables multiple offices to operate in the same psychical location. 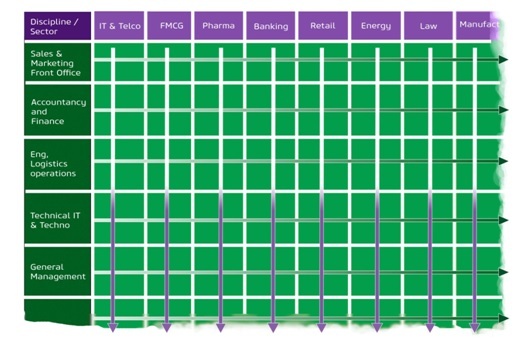 The matrix system illustrates how our focus is not only sector specific but can be across multiple areas of industry. We can truly add value over & above traditional transactional recruitment, adding significant value to the process by sharing our information, knowledge & experience. Global recruitment knowledge coupled with know-how gained from “in-the-field” career history enables us to offer recruitment expertise and additionally a global network of shared intelligence and resources. In addition to this, our positioning on the market is to offer recruitment services into the “Mid to senior level” roles so avoiding the low fee highly competition space, often a focus for generalist recruitment companies.